In vertebrates, the pubic bone is the ventral and anterior of the three principal bones composing either half of the pelvis. It is covered by a layer of fat, which is covered by the mons pubis. It is divisible into a body, a superior ramus and an inferior ramus. In the female, the pubic bone is anterior to the urethral sponge. The left and right hip bones join at the pubic symphysis. The pubis is the lower limit of the suprapubic region. The clade Dinosauria is divided into the Saurischia and Ornithischia based on hip structure, including importantly that of the pubis. An "opisthopubic" pelvis is a condition where the pubic bone extends back towards the tail of the animal, a trait that is also present in birds. 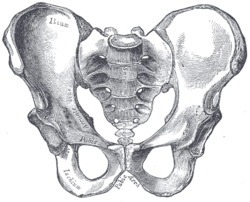 In a "propubic" pelvis, however, the pubic bone extends forward towards the head of the animal, as can be seen in the Saurischian pelvic structure pictured below. The acetabulum, which can be thought of as a "hip-socket", is an opening on each side of the pelvic girdle formed where the ischium, ilium, and pubis all meet, and into which the head of the femur inserts. The orientation and position of the acetabulum is one of the main morphological traits that caused dinosaurs to walk in an upright posture with their legs directly underneath their bodies. The prepubic process is a bony extension of the pubis that extends forward from the hip socket and toward the front of the animal. This adaptation is thought to have played a role in supporting the abdominal muscles. Non-placental mammals possess osteological projections of the pubis known as epipubic bones. These evolved first among derived cynodonts, and evolved as a means of support for muscules flexing the thigh, facilitating the development of an erect gait. However, these prevent the expansion of the torso, preventing pregnancy and forcing the animal to give birth to larval young (the modern marsupial "joeys" and monotreme "puggles"). Placentals are unique among all mammals, including other eutherians, in having lost epipubic bones and having been able to develop proper pregnancy. In some groups, remnants of these pre-pubic bones can be found as os penises. ^ White, T.D. (August 9, 1989). "An analysis of epipubic bone function in mammals using scaling theory". Journal of Theoretical Biology 139 (3): 343–57. doi:10.1016/S0022-5193(89)80213-9. PMID 2615378. ^ Michael L. Power, Jay Schulkin. The Evolution Of The Human Placenta. pp. 68–. ^ Frederick S. Szalay (11 May 2006). Evolutionary History of the Marsupials and an Analysis of Osteological Characters. Cambridge University Press. pp. 293–. ISBN 978-0-521-02592-8. Wikimedia Commons has media related to Pubis. Look up pubis in Wiktionary, the free dictionary. Anatomy photo:44:st-0713 at the SUNY Downstate Medical Center - "The Male Pelvis: Hip Bone"